Why We Should Thank Charles Dickens on His Birthday! 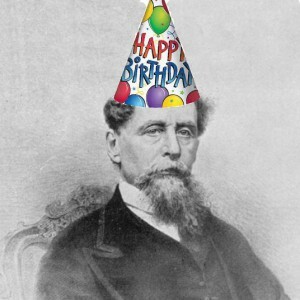 Every year we post a blog about Dickens around this date… it is his birthday, after all! What better way to honor our main man than keep his writing and memory alive? This year we thought we’d do something a bit different – instead of a long rambling blog about some aspect of his life, we thought we would remind you of a few ways that you see Dickens’ influence every day! True, Prince Albert (of Albert and Victoria) is often given the credit for reviving the Christmas holidays and traditions – he was the instigating factor in setting up a Christmas tree for the royal family! However, Dickens’ depictions of Christmas and the season at the time certainly helped people around the world begin to see Christmas as a time for joyous celebration with their loved ones! Where would we be without this word, which has become a household term for a deplorable level of poverty and poverty stricken folk. Many people attribute current celebrities ability and humor in characterizations and voices from Dickens! One of his interesting habits was to do all the voices of his different characters during his reading tours. Often, it was the way the characters spoke and expressed themselves that made the lines humorous. As Professor John Mullan of University College London said, “Quite a lot of the time, if you were simply to describe the plot situation of one of the set pieces that you find very funny, it’s not very funny at all… But it is very funny. The extraordinary thing he does introduce to the novel is the comic potential of the way people talk.” Voila! And we couldn’t very well have a blog thanking Dickens without bringing up some of the terms and phrases he brought us! Just think of these words, coined by none other than our main man! Very cool, eh? Happy Birthday indeed! This entry was posted in Charles Dickens, Uncategorized on February 7, 2018 by tavistock_books.